makes for a meal in itself! Traditional tabbouleh, or tabouli - there are a variety of spellings - is made with cracked wheat. 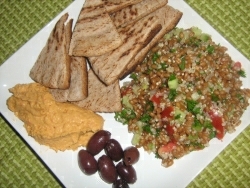 For this chewy tabbouleh recipe we used the whole wheat kernal. By utilizing wheat berries we have added a new dimension to this salad. The wheat berries give it more body and in a sense, make it a main entré versus a side salad. When we also decided to add in some quinoa we enriched this already delicious salad with even more nutrition! Place the wheat berries in a medium saucepan, cover completely with water and bring to a boil. Reduce heat to simmer and cook for about 30 minutes. In another smaller saucepan place the quinoa and bring to a boil. Reduce to a simmer and cook for about 15 minutes or until water is absorbed. When the wheat berries are cooked, rinse with cold water. Do not drain completely or the wheat berries will dry out quickly. After the quinoa is cooked and the water absorbed, allow both the wheat berries and quinoa to cool. In a large bowl combine the tomatoes, cucumber, parsley, green onions and mint. Add in the wheat berries and quinoa and thoroughly mix. In a small jar with a lid, combine lemon oil, olive oil and salt. Place the lid on tightly and shake the jar vigorously in order to mix the dressing well. Pour the dressing over the tabbouleh and toss to mix well. Serve immediately or chill in refrigerator for later. Serve the tabbouleh with toasted pita wedges and hummus and some kalamata olives. A fresh fruit side of orange wedges or apricot slices completes the meal.